How to Make Perfect Hard Boiled Eggs. Perfect boiled eggs have fluffy, yellow yolks. Here's how to get perfect results every time, so your Easter eggs will taste as good as they look. Have you ever eaten Easter Eggs that are so dry their yolks look almost green? Well Sam I Am had it right when he said he didn't like green eggs (we won't even talk about green ham). Perfect boiled eggs have fluffy, yellow yolks. Here's how to get perfect results every time, so your eggs will taste as good as they look. Put eggs in a large pot, in a single layer and cover with COLD water. Turn on the heat under the eggs and as soon as they come to a full boil, remove them from the heat and let them sit in the hot water for about 15-20 minutes. To make sure your eggs are fresh, put raw egg in a glass of water. If it lays on the bottom, it's fresh. If it is on the bottom, but the small end is up, it's still fine. If it is floating in the middle, but not on top, it should be safe, but not very fresh. If it floats, throw it away, it's a rotten egg. 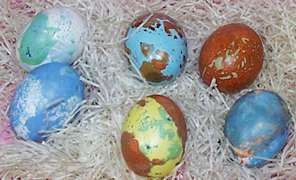 Follow this link for instructions on how to decorate the eggs in the photos, plus other fabulous egg designs!